1. The last of the eleven sons born to David in Jerusalem (II Sam. v. 16). In I Chron. iii. 6, 8; xiv. 5, 7, two sons of this name (A. V. "Elpalet" and "Eliphalet"; R. V. "Elpelet" and "Eliphelet") are mentioned, together with a son named Nogah, making the total thirteen. 2. The son of Ahasbai (II Sam.. xxiii. 34), identical with Eliphal, the son of Ur (I Chron. xi. 35), one of David's "thirty" warriors. 3. The third son of Eshek, a descendant of Jonathan (I Chron. viii. 39). 4. One of the clan of Adonikam, who returned from the Exile (Ezra viii. 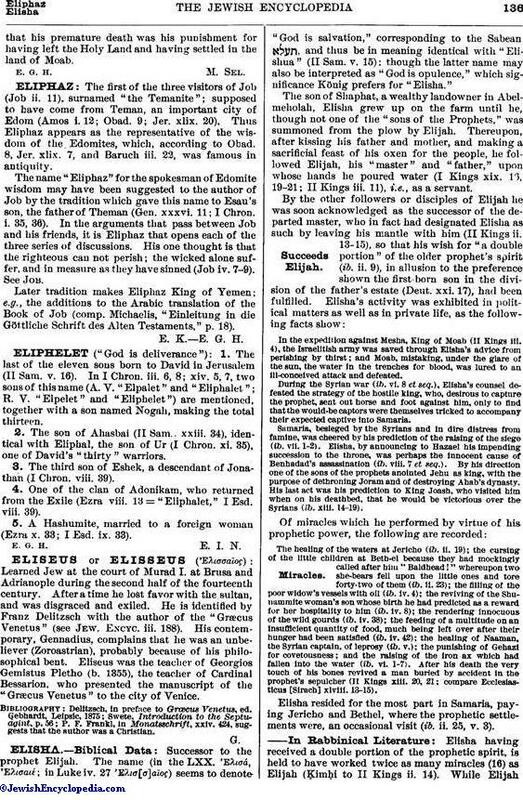 13 = "Eliphalet," I Esd. viii. 39). 5. A Hashumite, married to a foreign woman (Ezra x. 33; I Esd. ix. 33).